PASIG CITY, November 25, 2017 – Contrary to claims that the Department of Education (DepEd) allowed private lending institutions (PLIs) to offer loans to its teaching and non-teaching personnel because it receives “commission,” that small fraction actually goes to the Provident Fund from which all DepEd personnel may benefit. The service fee, which amounts to a measly 0.05%, charged for every remittance of the loan payment of a personnel-borrower, through the Automatic Payroll Deduction System (APDS) comes full-circle to benefit all Department personnel. To date, DepEd’s Provident Fund amounts to P4 billion. “Walang pakinabang ang DepEd dyan. 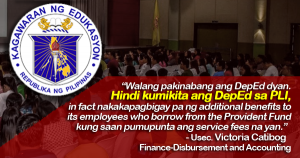 Hindi kumikita ang DepEd sa PLI, in fact nakakapagbigay pa ng additional benefits to its employees who borrow from the Provident Fund kung saan pumupunta ang service fees na yan,” Undersecretary for Finance-Disbursement and Accounting Victoria Catibog clarified. The same is true with loans from the Government Service Insurance System (GSIS), wherein the interest paid on loans of 12% comprises the capital for the retirement benefits of government employees. Unlike PLIs, GSIS does not pay fees to DepEd for servicing the loans of its personnel. The Provident Fund was established in 1992, through DepEd Order 97 (DO 97), initially aimed to benefit teachers and administrative support staff by providing loans for emergency needs; their education and their children’s; their hospitalization and of their immediate dependents; minor but immediate repair of their house; and other similar purposes to be determined by the National Board of Trustees. In 2007, through Deped Order 36 (Amendments and Addendum to DepEd Order 12, s. 2004), the aforementioned loan coverages were expanded to include death benefit and extended to the fourth degree of civil consanguinity or affinity of the borrower. With the expansion of the scope of academic and non-academic employee welfare as one of the priorities in the 10-Point Agenda of Secretary Leonor Magtolis Briones, ongoing initiatives include the reduction in the interest rate on Provident Fund loans and the conduct of a feasibility study on the issuance of health cards to all teaching and non-teaching personnel. Pursuant to the provisions of Administrative Order No. 279, the DECS Provident Fund is hereby established. Generally, the DECS Provident Fund aims to provide DECS officials and employees with benefits and loans for emergency needs; for their education and that of their children; for their hospitalization and that of their immediate dependencies; for minor but immediate needed repair of their houses; and for other similar purposes to be determined by the National Board of Trustees. The beneficiaries of this Fund are the teachers, as defined in the Magna Carta for Public School Teachers, and the administrative support staff (nonteaching) of the Central Office, the regional offices, and other field offices of the Department. As provided in the Implementing Guidelines of the DECS Provident Fund, copy inclosed, all regional directors are hereby directed to constitute their respective Regional Board of Trustees and Secretariat, and submit the names of the members to the Employees Welfare and Benefits Division, HRDS. The Provident Loan must be strengthen to facilitate the demands of the teachers. The coverage of loan must be at least conventional to what the private banks do. And so that teachers will not resort to loan in the private banks which have higher interests.